Sevenstones, Longships Watch, Sennen Cove, West Cornwall. 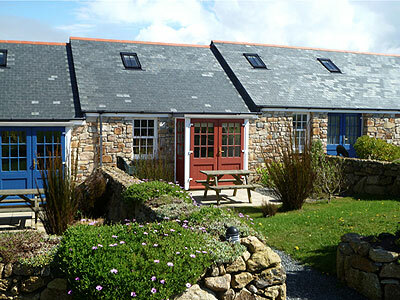 The Longships Watch complex comprises 5 high quality properties at the end of Maria`s Lane, overlooking Sennen Cove. Seven Stones is a wonderful three bedroom self-catering holiday cottage situated at Longships Watch, Sennen Cove comfortably accommodating six guests. There is an open plan lounge and dining area with a fully equipped kitchen, a downstairs double bedroom with en-suite bathroom, and a second bathroom. Upstairs there are two twin bedrooms with velux windows offering views over the gardens towards Lands End. Outside there is a private patio with picnic table and lawn and access to the picturesque landscaped garden. All bed linen and towels are provided and there is WIFI access as well as off road parking.